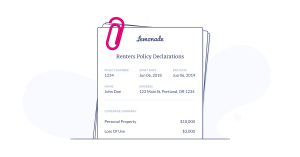 A declarations page is a summary of your insurance policy – it includes important stuff like coverage amounts, deductible, who’s covered, and more. So you purchased insurance, now what? Well, you should go and check your email (or mailbox), because your insurance policy will be there, waiting for you to review. Your insurance policy is essentially just a contract between you and your insurance company. And, like most legal docs, it’s pretty long and complicated, but it also has a summary, which in insurance speak is called a declarations page. This page, often referred to as a dec page, should be your go-to for important info like how much coverage you have on your place, what types of endorsements were added on to your policy, and even any discounts you may be eligible for. We’ll dive into that more in the following section. Directly following this page (or pages) will often be a definition of the terms found on your dec page. So, if you’re not sure about the meaning of one of the words in the declarations section, just skip forward to the following section for clarification. Once you get your policy, read over the declarations page extra carefully and make sure everything is correct. One of the most common mistakes we see here at Lemonade HQ is one of the smallest – an incorrect home address! And while you’re at it, make sure to double check your name, coverage amounts, deductible, and policy type (HO3 vs. HO5, etc.) – you can never be too diligent! Also noteworthy: If you plan to stay with your insurance company for more than a year, you’ll have a new dec page to review every year, since your policy term is typically 12 months long.